Through satellite technology, BYUTV has expanded the university community by millions. When BYU Broadcast Services applied for permission to operate a direct-broadcast satellite network in late 1999, John L. Reim, ’98, figured he could marshal the resources of KBYU-TV to get the network operational within a year. At the earliest, Reim thought, BYUTV could be on the satellite system within six months. Just a few weeks later, however, executives at the Dish Network, one of the United States’ two major direct-broadcast satellite providers, told Reim that BYUTV would have to fast forward its plans. 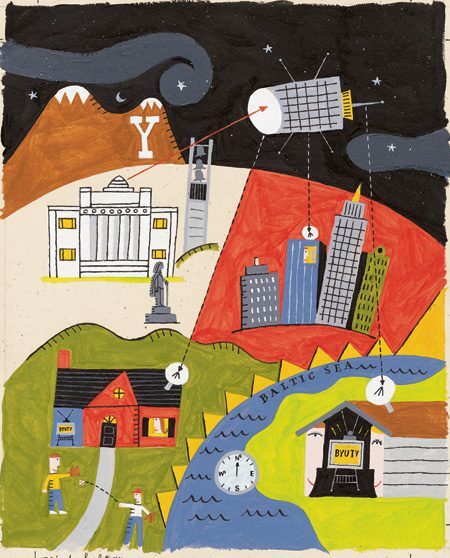 Reim, managing director of Broadcast Services, found out on a Tuesday in early January 2000 that BYUTV had to start broadcasting by noon that Friday. One of those miracles involved the selection of the first program to be broadcast on BYUTV. Reim wanted a program featuring President Gordon B. Hinckley, of The Church of Jesus Christ of Latter-day Saints, so he asked a KBYU employee to pull any tape of a speech by President Hinckley at BYU. As it turned out, the tape was President Hinckley’s November 1999 devotional address, “Keep the Chain Unbroken.” At the beginning of that talk, President Hinckley spoke of the ways our lives and the work of the gospel are blessed by advancing technology. Although BYUTV was not yet a reality when President Hinckley spoke, his words might just as well have been said about the effect the network now has on the lives of its viewers. “You and I are a part of the miracle and wonder of this great cause and kingdom that is sweeping over the earth blessing the lives of people wherever it reaches,” President Hinckley said. 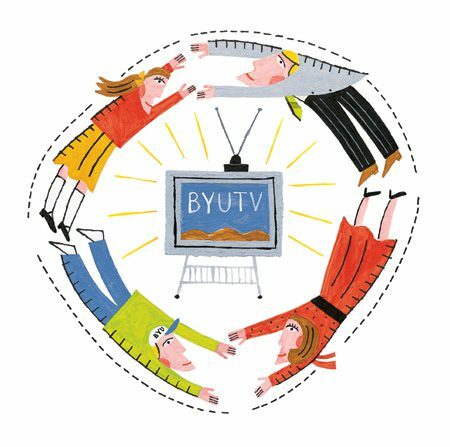 When it began at 12:01 p.m. on that Friday in January 2000, BYUTV had only a four-hour continuous loop of programming, but Reim, now also the CEO ofBYUTV, knew that a powerful phenomenon had been born. Today, the heart of that phenomenon is a 24-hour satellite and cable TV network that carries educational, family-oriented, and religious programming from BYU into 20 million homes across the country. “It didn’t take us very long to understand that this was a blessing to a lot of people,” he says. Although three of her four children attended BYU, Carol H. Petranek, who works for NASDAQ in Washington, D.C., visits Utah only infrequently. For years she felt out of the loop of BYU and Church events along the Wasatch Front. “You feel cut off,” she says. When Petranek learned of BYUTV‘s availability on the Dish Network, she immediately subscribed. She now enjoys coming home from work to watch BYUTV, particularly the broadcasts of Book of Mormon discussions by BYU religion professors. “That, to me, is the epitome of what BYUTV is—bringing to the world things that were once available only on the BYU campus,” she says. McNair became a fan of the Mormon Tabernacle Choir at age 10 and spent several decades chasing the choir’s broadcasts on various radio and television stations. When he discovered that the choir could be seen on BYUTV, McNair was elated. McNair and his family frequently watch BYUTV on Sundays and in the evenings after work and school. His favorite BYU programs are those that feature choirs directed by Mack J. Wilberg, ’79, and discussions of both the Pearl of Great Price and the Book of Mormon. McNair visited Provo just once, while in Utah for an organ master class at the Tabernacle in Salt Lake City. However, his familiarity with BYU through BYUTV has McNair convinced it would be a good place for his children to attend college. Even BYU President Merrill J. Bateman and his wife, Marilyn, have received e-mail messages and telephone calls from BYUTV viewers. One caller was a friend who became a member of the Church 30 years ago when the Batemans lived in Pennsylvania. The ways that BYUTV fulfills its promise of “Keeping You Connected” are not limited to the United States, either. Outside the United States and Canada, BYUTVcan be seen on the Church satellite network. For the Ronne Branch of the Church on the tiny island of Bornholm in the Baltic Sea, BYUTV was a bonus for purchasing equipment to receive satellite broadcasts of General Conference and Church Educational System firesides. “My wife and I simply love to watch BYUTV,” branch member Per Borgen wrote. The beginnings of broadcast satellite networks like BYUTV can be traced to “Extra-Terrestrial Relays,” an article in Wireless World in October 1945 written by British author Arthur C. Clarke, who wrote the screenplay of the 1968 film 2001: A Space Odyssey. In his visionary article, Clarke proposed a system of “radio controlled rockets” that could be sent into orbit around the earth and left there to broadcast signals to various parts of the globe. Clarke saw the system as a better alternative than land-based systems, which were awkward and prone to failure. “Many may consider the solution proposed in this discussion too far-fetched to be taken very seriously,” Clarke wrote. However, by 1962 the AT&T satellite Telestar 1 had successfully been placed in orbit and had relayed television signals from North America to Europe. If not for that mandate, BYUTV would have been too expensive for the university to operate. “Initially, I didn’t think it would be financially possible,” says President Bateman, who has been a chief supporter of BYUTV and other methods of extending BYU‘s influence through technology. However, digital technology, FCC public-interest mandates, and the existing infrastructure of KBYU combined to make BYUTV a reality at a relatively low cost. The hurried January 2000 launch of BYUTV on the Dish Network, which had about 3.5 million subscribers at the time, happened without fanfare. Nevertheless, viewers slowly began discovering the channel. In December 2000 DirecTV added BYUTV to its lineup, bringing the number of U.S. homes with access to BYUTVto about 17 million. Recently, BYUTV was picked up by local cable providers in Utah, Wyoming, Nevada, and Arizona. While that brings the total number of U.S. households withBYUTV to 20 million, there are more than 60 million cable subscribers in the United States without it. Making inroads with that cable market is one of BYUTV‘s major goals. “We hope to make this service as ubiquitous as possible,” Reim says. Much work remains to be done. Of the 9,947 local cable providers in the United States, BYUTV is seen on fewer than 10. But both President Bateman and Reim expect that number to grow because BYUTV offers cable providers a chance to increase their subscription base, particularly in markets with large Latter-day Saint populations. President Bateman sees BYUTV as a dramatic example of the potential for technology to overcome the limited physical capacity at BYU‘s campuses in Provo, Idaho, and Hawaii. Through BYUTV, the university may eventually offer its scholarly and religious expertise to anyone with access to satellite or cable television. With major pieces of the infrastructure in place, BYUTV is focusing on refining program offerings. President Bateman says BYU knows that people want to see Education Week and Women’s Conference, and those programs will continue to be offered. But now, BYU is devising ways to increase the cultural events, classroom discussions, athletic events, and other campus activities shown on BYUTV. Because of the Mountain West Conference’s contract with ESPN, however, most men’s basketball and football games are not broadcast live but are shown on a tape-delayed basis. Some religion courses may be offered on BYUTV, but the Internet will continue to be the primary delivery method for those seeking degrees through distance learning. BYUTV officials foresee a broader purpose for the network than serving only those seeking diplomas. BYUTV also broadcasts general conference (live and tape-delayed), classic Latter-day Saint short films like Johnny Lingo, and documentaries on such Latter-day Saint luminaries as artist Minerva Teichert. BYUTV has broadcast the PBS documentary American Prophet: The Story of Joseph Smith and the Light of the World, which was presented at the Conference Center during the 2002 Olympic Winter Games. BYUTV officials see the opportunities for content as virtually endless. This year, BYUTV will add 30 hours of broadcast time for dramatic productions from the College of Fine Arts and Communications. Eventually, a news magazine show could profile BYU professors and their research. BYUTV has forged a partnership with caretakers of the Church’s audiovisual archives that will, according to Reim, bring to BYUTV the kind of content viewers want. Church employees and volunteers are currently combing the Church film archives, Church Educational System productions, and content produced for such places as Church visitors centers to determine what programming would fit BYUTV‘s needs. The Church is “an important content partner because that’s what the viewers of this channel want,” Reim says. The Church has also agreed to look for ways to produce future content that will be appropriate for and made accessible to BYUTV. “BYUTV is not the only delivery method for BYU and the Church, but it is an important one,” Reim says. One highly popular type of programming involves BYU religion professors engaged in scriptural discussions with one another. Sixty-four half-hour episodes on the Book of Mormon have been produced, and more are planned with other books of scripture. Above all, BYUTV represents the best of BYU. In that sense, it cannot be classified as either wholly academic or wholly religious. Ed Carter is a student at BYU‘s J. Reuben Clark Law School. INFO: Up-to-date information about getting BYUTV, as well as an in-depth program guide, is available online at byutv.org or by calling 1-866-662-9888. In the United States BYUTV can be seen on two direct-broadcast satellite systems: Dish Network or DirecTV. Although interested individuals can purchase satellite systems from local retailers or from Dish or DirecTV directly, BYUTV has arranged with Utah-based NewStar Communications to provide priority installation nationwide to those who wish to receive BYUTV via either Dish Network or DirecTV. NewStar can be reached through a link on the BYUTV Web site (byutv.org) or by calling 1-800-528-1999 and by using referral code 2011. The Dish Network’s Top 50 package (channel 9403). Dish Network subscribers must have the Dish 500 system to receive BYUTV, because the network is located on the Dish Network’s second satellite. Those interested in receiving BYUTV may contact NewStar Communications, any Dish Network reseller, or Dish Network directly at 1-800-333-DISH. DirecTV PLUS‘s basic Select Choice package (channel 374). DirecTV PLUS subscribers must have a multi-satellite 18-by-24 oval dish and related receiver, because BYUTV is located on DirecTV’s second satellite. Those interested in receiving BYUTV may contact NewStar Communications, any Dish Network reseller, or DirecTV directly at 1-800-DIRECTV. Many parts of Utah. AT&T Digital Cable carries BYUTV (channel 34, or check your local channel lineup). AT&T plans a gradual rollout of upgraded cable services that will include BYUTV in the basic/expanded channel lineup. Phoenix. Cox Digital Cable carries BYUTV (channel 112). Las Vegas. Cox Digital Cable carries BYUTV (channel 384). Mesa, Ariz. The All-American Cable System carries BYUTV (channel 97). Cowley, Wyo. Cowley Cable Television recently added BYUTV to its channel lineup. BYUTV can be viewed on the Internet at www.byutv.org using Microsoft Media Player. Both Windows and Macintosh versions of the media player can be downloaded at www.microsoft.com/windowsmedia/. BYUTV is best viewed via a high-speed Internet connection.